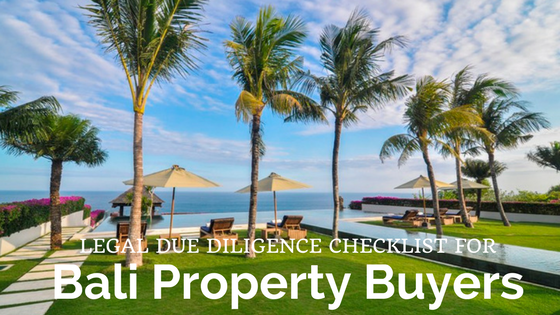 Any time you acquire Bali property, you face certain legal risks. Whether you acquire the property through a merger and acquisition of a corporation that holds property, or through a direct acquisition (such as land purchase), unforeseen legal problems can arise. Some common problems faced by real property buyers or transferees include eviction issues, restrictions on land use, or restrictions on building construction. If you plan to acquire any immovable property in Indonesia, before completing the purchase you should conduct due diligence to ensure that the seller is the legal owner and has the right to sell the property to you, and to check for any legal encumbrances or attachments. In practice, a property practitioner with a strong legal background can conduct real estate due diligence for you by reviewing copies of the land documents (such as the title deed), checking for building construction permits, and conducting a title search at the Land Office where the land is located. More specifically, you should ensure that you receive a comprehensive due diligence report, including the following material details and information. Under Indonesian law, the hierarchy of land documents ranges from a notice of possession of land to a title deed, which is the highest level, representing full and complete ownership rights. It is therefore necessary to know the level of hierarchy of the title, the background of the land documents, and whether they have been properly issued or upgraded from other documents or evidence of a lower level in the hierarchy. This section should specify the land details (its area), a map miniature, and also show the surrounding land. This should verify the history of the ownership of the land. You need to check whether the title deed was legally issued, particularly when the original ownership document was not a title deed, but a lower level of document. Under Indonesian law, all mortgages, easements, servitudes, and other encumbrances created over land must be made in writing and registered with the Land Office where the immovable property is located in order to be valid. Indonesian law requires that a lease of immovable property for more than three years must be written and registered by a competent official. If the duration of the lease is three years or less, it cannot be registered with the Land Office, but it must still be made in writing. This section of the due diligence report will state whether the land is leased to any other person for more than three years or whether there are any other tenancy rights (usufructs or right of benefit, habitation rights, etc) which may affect the buyer’s right to use the land. A contract to lease immovable property is not extinguished by the transfer of ownership. Therefore, the transferee is entitled to the rights and is subject to the duties of the transferor toward the lessee. You should also conduct a litigation search to check whether there are any litigation cases against the owner which may affect the property. In Indonesia, land use is regulated under the City Planning Act for residential, industrial, agricultural, environmental and cultural protection, or other purposes. Additionally, the construction of a building must be in compliance with the relevant rules, regulations, and notifications issued under the laws governing building control and the environment, as well as other relevant laws. Therefore, this section of the report is meant to provide the buyer with the current zoning, building control, and environmental regulations that cover land use and building construction, so that you will be informed of whether the land can be used and built upon, as intended. It will thus confirm whether the buildings constructed on the land have been properly granted a construction permit (IMB) and other requisite permits. Generally, a plot of land should have access to a public road, whether the land is adjacent to a public road or through another landowner’s property. If access will be through another person’s land, servitude should be registered over the land granting the right to access the target land. It is important to know the official assessed price, especially when the property transfer will be registered with the Land Office, as the official assessed price determined by the government authority (which is generally lower than the market price and the actual sale price) is used to calculate the transfer fee to be paid to the Land Office upon registration of the property transfer. Finally, in addition to above information to be included in your due diligence report, we recommend that you should conduct an on-site survey, in cooperation with your property (legal) practitioner, to observe the land location, to ensure it is the same land you intend to purchase, and to confirm that it matches the same plot as shown in the land documents.